Ben Swift will be given the freedom to chase Giro d'Italia stage wins in the absence of an obvious contender for the overall victory in Team Sky's squad. Richie Porte had been expected to lead the nine-man team but pulled out to focus on the Tour de France in July. Swift, 26, who is the only British rider in the three-week race, which starts in Belfast on Friday, has never won a stage in a Grand Tour. "All nine riders will be given a chance to show their card," he told BBC Sport. "It's really hard but I have to go in with that goal to win at least one stage. My condition has been pretty good and all the form is there. I'm excited." Yorkshireman Swift followed a third-place finish at the Milan-San Remo one-day Classic in March with a stage win at the Tour of the Basque Country in April and will be joined by Irishman Philip Deignan when Sky line up for the team time trial that will open the Giro start in Belfast on Friday. "With the team that we've got there is no one solid option for the general classification." he added. "That doesn't come around all that often with Team Sky and it's come at one of the biggest races in the world so is a fantastic opportunity for everybody." The Giro d'Italia is famed for its stunning scenery and gruelling climbs, and this year's route is no different. The pink jersey is the most coveted and is given out each day to the general classification leader - the rider who has the best aggregate time. The blue jersey is given to the best climber, with points awarded at the top of each classified climb. Similarly, the red is awarded to the rider with the most points earned at stage finishes and at intermediate sprints. The white is given to the best placed under-25 rider. After a three-stage "Big Start" taking in Belfast, Armagh and Dublin, the race flies south to Italy and it is the rider who performs best in the mountain peaks of the Apennines and Alps who will ultimately be crowned winner of the 21-stage event. With the route to include a 26.8km mountain time trial on stage 19 before a summit finish on the brutal Monte Zoncolan on stage 20, only a climbing specialist stands a chance of claiming overall victory in Trieste on 1 June. Nonetheless, Swift has earmarked several stages that could suit his sprinting abilities. "There are potentially 10 stages that could have some sort of sprint involved in it but not too many where there is a climb towards the end that could leave a select group competing at the finish - that is where I have proved I am at my best I think," he said. "But looking at stage seven, it could be one of those. "The scenery, the atmosphere and the fans make the Giro a really romantic race - it's always had a special place for me because it was my first Grand Tour in 2009 with team Katusha - but it's also really, really hard. The mountain stages are really tough. "The start in Ireland is going to be amazing. They're going to embrace the Giro coming to town so much, I just think they're going to lap it up. It will be a great experience." Movistar's Nairo Quintana, who showed signs of great potential with a second place finish to win both the white jersey for best young rider and the polka dot jersey for best climber at his debut Tour de France last year, is the bookmakers' favourite for overall victory. The Colombian rider, 24, is targeting success at the Giro and the third of the Grand Tours, La Vuelta a Espana, this season, having announced in January that he will not be racing at the Tour. Other contenders include Spaniard Joaquim Rodriguez, who won a second Volta a Catalunya in March, and Australian Cadel Evans, Tour de France champion in 2011 and Giro points classification winner in 2010, while Garmin's Irish rider Dan Martin could also impress. Defending champion Vincenzo Nibali is not racing. "A lot of the climbs are perfectly suited to Quintana and he will absolutely fly up the Zoncolan," Swift says. "Martin obviously will have made it a big target for this part of the season and I think you have to look at Evans, who has just won the Tour of Trentino. There are lots of riders capable of a good race. "In terms of contenders from the Team Sky squad Dario Cataldo and Kanstantsin Siutsou, who are normally domestiques, are going to be given a chance to ride it and stay there for a long as they can." 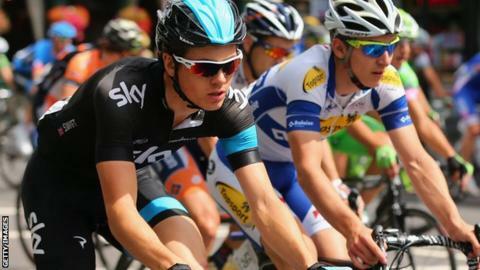 Following the withdrawal of fellow Team Sky rider Peter Kennaugh, Swift will be the only Briton competing in this year's race. Omega Pharma-Quick-Step rider Mark Cavendish, who won the red jersey in the Giro's points classification competition last year, has also withdrawn in order to focus on his preparations for the Tour. Should Swift be successful in his search for a first Grand Tour stage win in Italy in May, he would become just the seventh British rider to have ever won a stage at the race. Cavendish, Vin Denson, David Millar, Alex Dowsett, Robert Millar and Sir Bradley Wiggins have 20 individual stage triumphs between them.